For many reasons, this past week of workouts didn’t go exactly as exactly planned. My biggest obstacle was my schedule. Between chiropractor and dentist appointments after work this week, Tuesday evening was the only day that I didn’t have an appointment after work. Just to paint one picture for you of how this week went after work, my dentist appointment was Thursday after work. Our dentist is near our old apartment, and it took me well over an hour to get home from the dentist. By the time I finally made it home on Thursday, I had been out of the house for close to 13 hours. One highlight of my week was the yoga class that I took at work on Monday. One of our professional development options for the day was yoga, as a way to focus on destressing. It was a great way to ease back into work after Spring Break. The other highlight of this past week was running the Cherry Blossom Ten Mile Run yesterday morning. I’ll recap the race this week, but as I shared in my goals post, this wasn’t a goal race for me. And I’m glad it wasn’t since the course had to be cut short due to a pedestrian that was hit prior to the start of the race on the race course. According to my Garmin, I ran 9.49 miles during the race. Despite the emergency, it was an absolutely perfect morning for a race, and I loved that the cherry blossoms were at peak bloom. QOTD: Have you ever run a race where the course had to be cut short due to an emergency? This entry was posted in Training and tagged Cherry Blossom Ten Mile Run, running, training, treadmill, walking, weekly recap, weight training, yoga. Bookmark the permalink. the course was cut short due to an emergency? Crazy! No I haven’t had that happen! Sadly, yes. The accident involved a motorcycle and a pedestrian. OH wow! I hope the pedestrian was ok! Fortunately all the races I’ve run have been the full course. Can’t wait to read your recap! Last I heard yesterday they were taken to the hospital but I haven’t seen/heard an update today. I’d love to run through some cherry blossoms. I have been looking for something like tear here in Colorado, when I lived in Japan we watched the cherry blossoms every year. Keep up the great training. I would love to go to Japan and see the Cherry Blossoms there. Looks like a great week of training. I’ve never run a race that was cut short. Yikes! It was definitely scary to hear about the accident. I had read about the pedestrian getting hit before the race 😦 I hope that the race was a better experience for you than last year in spite of the route change! For the most part, yes. It definitely helped to start in the correct corral this year. Yikes! I haven’t had a course cut short, and I do hope the pedestrian is OK.
Huh, I got 9.52. Wish they could’ve given us something more precise but of course there wasn’t much time. I think they did the best that they could given how quickly the change had to be made. The weather couldn’t have been nicer! You should definitely run it one year. If you’re lucky and run it a year when the blossoms are at peak bloom, like they were for this year’s race, then it makes for such a gorgeous race course. Our cherry blossoms are at their peak right now too. Pink and white ‘snow’ everywhere around the city! Great pictures! Thanks Elle! I can’t wait to share more in my recap! i was super impressed by how well the race organizers handled the last minute change. i would’ve barely noticed (aside from the mileage on my watch) if they hadn’t told us! I was impressed too. They definitely made the last minute change seem seamless. This winter was so brutally cold that we had a half marathon cut down to half the distance run in 4km loops. It was about -40C and the course is fully exposed to the elements. Yikes! I’m not sure that I would have been brave enough to still run a race if it was that cold outside! Great week of workouts! So glad to see those rest days – they are so important!! Yoga is seriously the highlight of my week as well! So glad I discovered how amazing it is for me mentally and physically! Yoga is great for so many reasons. What an unfortunate start to the race, but it sounds like they handled it well. We all have those weeks where life gets in the way of training, and that’s totally okay. They couldn’t have handled it better. It was such a gorgeous course yesterday! I can’t imagine how beautiful that race was, great job! Oh my goodness, that is awful that someone got hit by a car. Wound up being a motorcycle, but yes, so sad. Glad that you had a perfect morning for a race, and really glad that they didn’t cancel it all together or something because of the accident. When I first heard about the accident I was very worried that they race would be canceled or delayed. Wow that’s crazy! Did you see it happen? Were they a runner? Not sure how I’d feel if I had actually seen it as it happened. No, it happened before we got downtown. The blossoms were perfect this weekend. I bet the morning race was gorgeous. I’m surprised more people weren’t hit over the weekend it was that crazy down on the mall. It was an absolutely gorgeous course for the race with all of the blossoms at peak bloom. I’ve had a few courses become “fun runs” due to heat and a couple of threats of closing course due to weather, but never any emergencies. Glad they were able to figure out a workaround, even if it meant less than 10 miles. I love that you get to take yoga as a professional development option! This was the first time we’ve ever had it as an option, and I certainly hope not the last time! 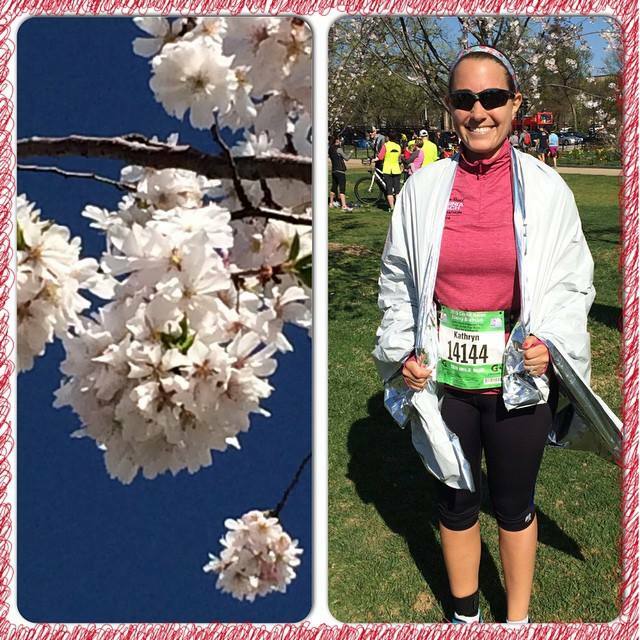 Cherry blossom run sounds like it would be so pretty! Oh no! So sorry to hear about the emergency… sad the run had to be cut short but that comes first. Is the race director doing anything to compensate for the shorter route though? Once they have an exact measurement of the revised course they’re going to not only post the official results but also an estimate of what our 10 mile finish time would have been. I’ve run a race when the course was cut short due to runners’ error. I thought it was so funny that everyone kind of following the pack ended up making a wrong turn. I didn’t even think to be frustrated haha! Its hard to be frustrated when everybody else made the same wrong turn. That is scary about the accident. Luckily the race directors acted fast even though it cut the race short.